While style is an important consideration in choosing a new chandelier, don't overlook the finer points of scale, installation requirements, and, most important, how well the fixture will satisfy your lighting needs. Nothing epitomizes decorative lighting quite like a chandelier. A chandelier is the jewelry of a room, accenting the architecture, furnishings, and decor. With so many fixture choices available and so many possible applications within the home—in dining rooms, dens, and even bedrooms and bathrooms—choosing a chandelier can be overwhelming. But if you adhere to a few design rules and installation tips, you’ll be on your way to dressing your room right—and in the best decorative light. There are chandeliers available to suit any style and decor. Fixtures that have their lights directed up are more traditional; the most formal of these fixtures showcase bare candelabra bulbs. 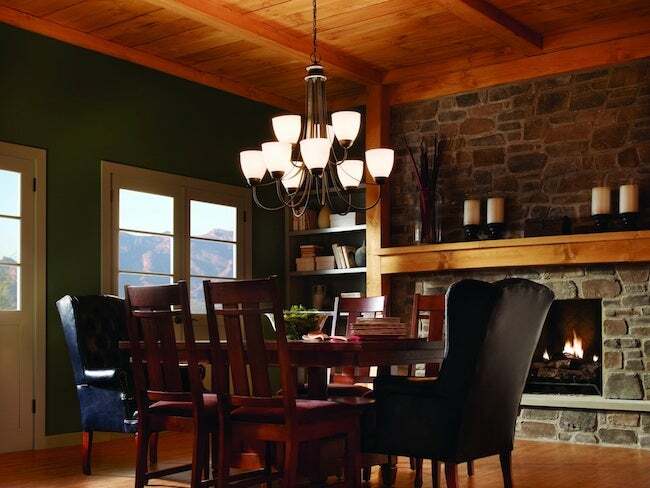 Adding glass or chandelier shades softens that formality, resulting in a slightly more casual attitude. For a more informal feeling, choose a chandelier on which the lights are directed downward. An additional benefit of this more casual design is that your decorative chandelier can also serve as task lighting—aiding cooking or homework duties. In general, metal finishes are more formal than painted ones. If your chandelier is serving a primarily decorative purpose, it can really be the focal point of the room, highlighting the beauty of your furnishings and decor. If, however, you require task lighting, find a fixture that also has a downlight, to illuminate the surface beneath it. For either application, don’t miss out on the flexibility that you’ll get by installing a dimmer switch. Dialing the lights down can create a warm glow, similar to candlelight—perfect for evening entertaining. Jaspers also has tips for determining the correct hanging height. For a dining room, “the chandelier should hang approximately 30 inches above the tabletop in an 8-foot ceiling. For each additional foot of ceiling height, add one inch. In a 10-foot ceiling, the chandelier should hang approximately 32 inches above the table.” You should keep in mind that in rooms with lower ceilings (less than 9 feet), a chandelier may make the ceiling feel low. If you must hang a chandelier in a room with a low ceiling, be sure to hang it high enough so that it doesn’t become a hazard. If possible, mount it over a table to avoid bumped heads and to keep it from impeding foot traffic. If you’re putting a chandelier in a bathroom (Sure!—why not?! ), the rule of thumb is to keep it 6 feet away from the shower or tub. Moisture is the enemy of electrical wiring, so purchase a model that is rated for “wet” or “shower location” use. With so many options available, you’re bound to find a fixture that suits both your practical needs and decor. With the right fixture, you can just dim the lights and turn up the style—a chandelier brings it all together. This article is sponsored by Bellacor.com. Its facts and opinions are those of BobVila.com.